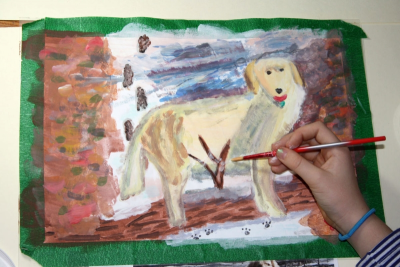 Students work from a photograph to paint a portrait of a pet. 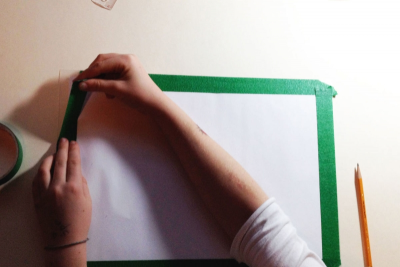 Tape your paper to a plastic mat. This will keep the paper smooth and flat while you work. When the tape is removed it will create a white border around the painting. Use 2 'L' shaped pieces of card as a viewfinder. Place them on the photograph to crop the picture. Move the viewfinder around until you are happy with the composition of the picture. 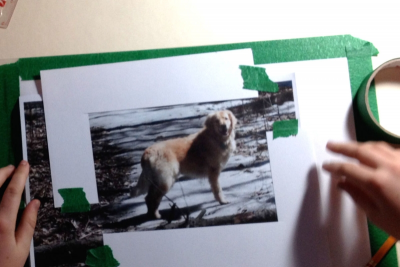 Make sure your cropped photograph is roughly the same shape and proportions as your painting paper. This is the picture you will be painting. When you are happy with the placement of the viewfinder tape it in place. 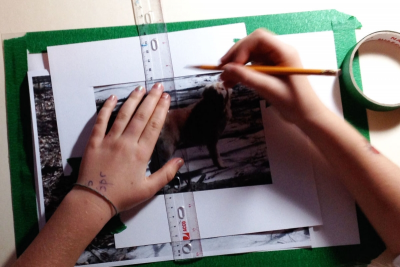 Draw a vertical line across the middle of your photograph. 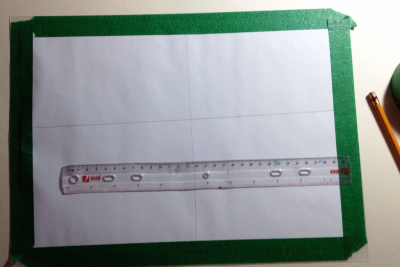 Draw a horizontal line across the middle of your photograph. You should have divided your photograph into 4 fairly equal boxes. Repeat this process to divide your painting paper into 4 equal boxes as well. 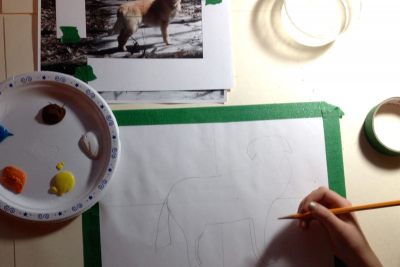 Use the grid to help you draw the animal. Start in one of the boxes. Look at where the outer edge of the animal begins and ends. Outline the same edge in the matching box on your painting paper. We are using a big grid to help you see the space. Don't worry if it is not perfect. For this painting you just need to block in the main objects to get you started. Begin laying down areas of colour. Use brushstrokes and contrasting colours to create different textures. The photograph is just a way to get started. Don't be afraid to add effects that are not in the photograph. Let your imagination guide you. Build up colour and texture. 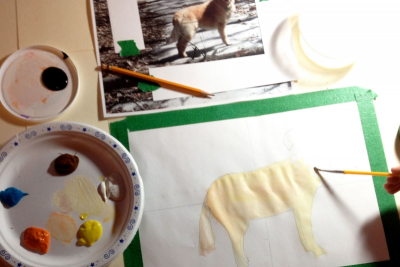 Work with areas of contrast to make the animal stand out in the space. From time to time stop and look at the painting from a distance to see it with fresh eyes. When you are satisfied with your work and the paint is dry gently remove the tape. Look at the painting closely. Add any final last touches. It is ready to be matted and displayed! Support their ideas with evidence found in the works. Chuck Close is an inspirational artist who has dyslexia and is partially paralyzed. He makes very large paintings using a grid system. View the video of the artist Chuck Close discussing his use of grids and encourage students to experiment with some of his ideas. Look at the composition of the pictures. Zoom in on parts of the paintings to examine the way paint has been applied in a loose, expressive manner. Ask students how they feel about this approach. How does it influence the way they feel about the animal? 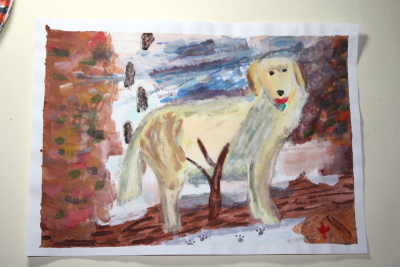 Ask students to think about how they will use paint in this challenge. 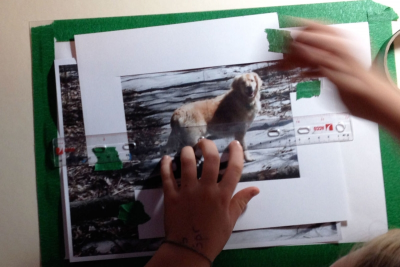 Draw an animal using a grid and photograph. 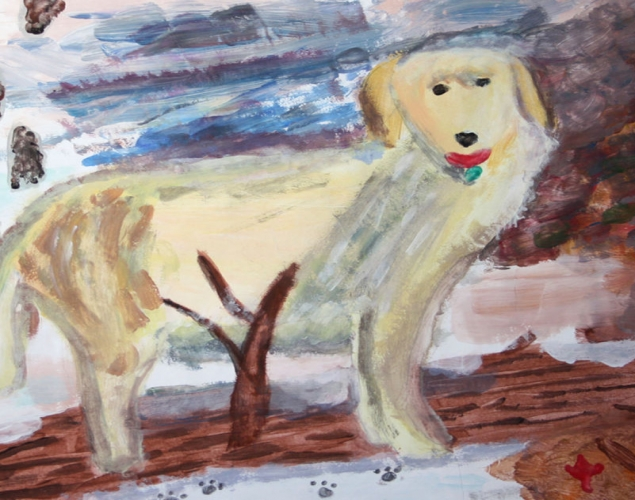 Create a painting of a pet using painting techniques such as blending and expressive brushstrokes. Use contrast to create the illusion of depth. Support your ideas with evidence found in the works. 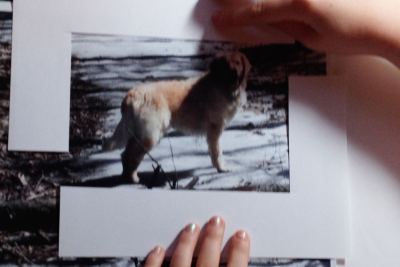 Guide students to crop their photograph. Remind them of the compositions they viewed in the paintings. 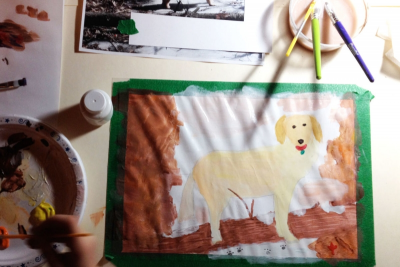 Encourage them to decide what the most important part of their painting will be. That is what they should focus on. Where will it be placed for maximum effect? Ask students to prepapre their paper by taping it to the plastic placemat. Remind them that the tape will create a border. Continue to guide students in the preparation of the painting. Cover tables with newspaper. This keeps the tables clean and provides a space to try out paint colours and techniques. Ask one student from each table to get a paint kit. This student will be responsible for returning the kit in good condition at the end of the lesson. Observe students as they work. From time to time ask them to stop and view their work from a bit of a distance so they can see it with 'fresh eyes'. Display the completed paintings for a group discussion. Remind students of the challenge. - Look closely at the paintings. - Choose one that interests you for some reason. - Share thoughts about the work. 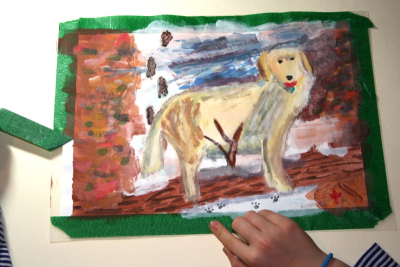 Observe students as they discuss the art works – active listening, insightful contributions, supporting ideas with evidence found in the artwork and from personal experience.